Some of the best digital storytellers in the world have spent decades to refine their craft. However, there is one asset they cannot obtain through training: the imagination of a child. Children are often the most creative storytellers of us all! However, it isn't always easy to get children to convey their own stories. You can't just let them write whole books from the get go. Luckily, thanks to technology, children can now use digital storytelling apps to help them to create and record their stories. Through their accessibility, these 6 apps allow children to easily create their own stories. It doesn't get any easier than this. This app allows children to choose a character, an emotion and a background. Next, they can record their voice, et voilà! Their first scene has already been finished. No creativity is wasted on the complex process of designing characters and backgrounds digitally. Instead, children can fully focus on the storytelling part. Though, it has to be mentioned that this app is quite basic: children can only create one scene, containing only one character. Nonetheless, the app seems to be a great introduction for children into the world of digital storytelling. The app is free, though contains some in-app purchases, and is available on both iOS and Android. It is recommended for children above the age of 4. Draw a Stickman is a videogame in which children can engage with a fixed story in an interactional way. Whenever the main character, Stickman, encounters a problem, he asks the player to draw something that can help him overcome this obstacle. This way, very young children can expand their vocabulary. Another possible advantage is that children can think in advance about how this particular object will help Stickman. This makes Draw a Stickman a great tool to help children develop their ability to think logically and to understand how stories work. The game is available on iOS and Android, where you can try 3 levels for free. 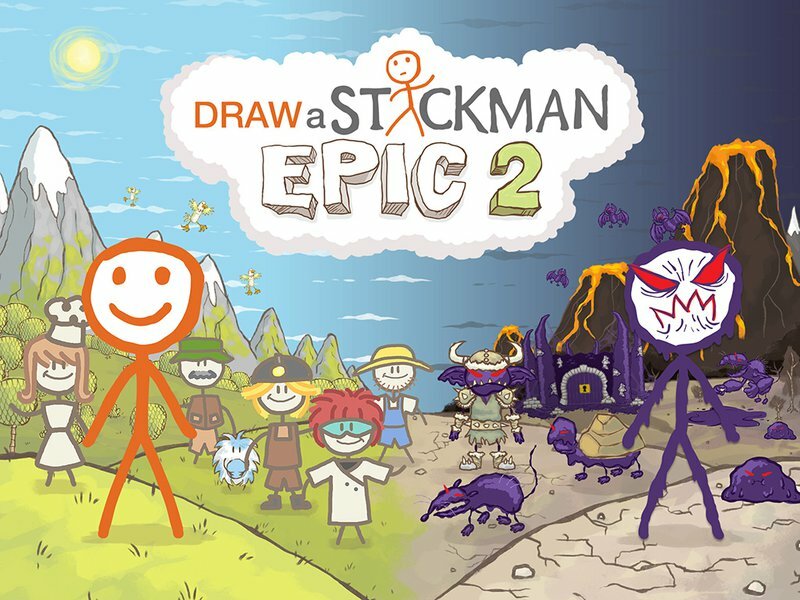 Draw a Stickman: Epic 2 is also available on Wii U and Nintendo Switch, where it costs €6,99. It has a PEGI-rating of 3 years and older. Another digital storytelling app that could not be any easier to use. You begin by clicking the giant "Create a story"-button and off you go! Next, you can choose from a wide range of pre-made stories. Examples are: "I'm a dinosaur", "My best friend", and even stories that touch on worldwide problematics, like "Dog ate my homework". The story then begins with one sentence and a blank "canvas", which the future storyteller can fill up with characters, backgrounds, pictures, voice recordings, and even music. Once the scene has been arranged, this process can be continued, until the book is finished. Still not convinced that Scribble Press is a great app? Then watch this video of a woman having the time of her life, while playing around with the app. If you want your child (or yourself, we don't judge) to have such a great time as well, you can buy the app for €4,99, exclusively on iOS. Again recommended for children above 4 years old. This app works exactly the same as Tellagami, but we would still like to include it, because it invites children to a different way of storytelling. 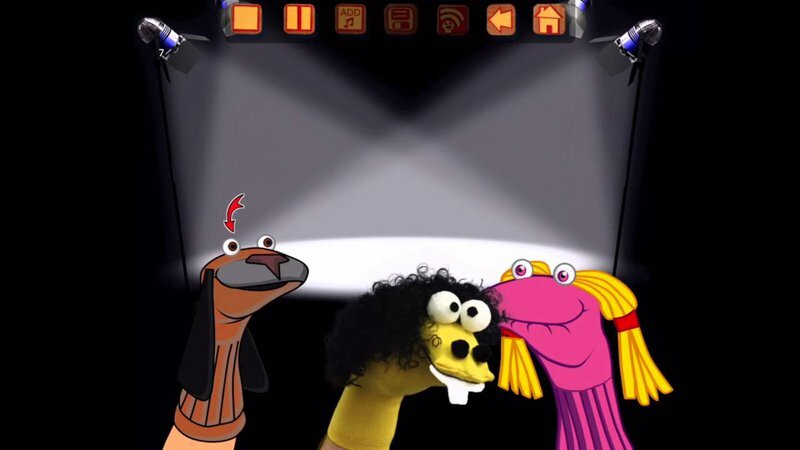 Whereas stories created with Tellagami often take place within sterile settings, Sock Puppets takes children to a digital theatre. The same system of choosing characters and backgrounds, and adding a voice recording to them, is still handled. The difference in setting, though, invites children to be more creative, by giving them the idea that they are creating their own theatre show. They won't even notice they are in class anymore. Therefore, Sock Puppets is the ideal tool to trick your children into learning! The app is available for free in iOS, again with in-app purchases. Children can enjoy this app, starting from the age of 4. If you found the previous apps a bit underwhelming when it came to technological complexity, this should be the digital storytelling app you were looking for. This impressive app not only lets children create their own stories, it makes them think about various storytelling concepts as well. They have to choose how many scenes constitute the beginning, the middle, and the end. This invites children to think about what their story will look like, before they begin creating their story. It also prevents children from just messing around with the app, and possibly not really learn anything from it. Another plus: whenever the young storyteller creates a "beginning" scene, for example, the app tells them what characteristics a typical beginning has. The app thus also educates children about storytelling terms and concepts. It is available on both iOS and Android, and is entirely free! Children of ages 4 years and above can start their digital storytelling journey with this app. One of the greatest digital storytelling methods for children is stop motion. This app is a handy tool to help children to edit their stop motion creations. However, unlike the aforementioned apps, it is socially acceptable for adults to use Stop Motion Studio as well, while stop motion films can of course be created by both young and old. We would even recommend parents to help their children while they are using this app, because it is not specifically aimed towards children and can be more difficult for them to understand how to use it. Nonetheless, it is still a great tool for parents and children to edit their stop motion stories. The app is available for free on iOS and Android, though again, in-game purchases are possible. Recommended for children of ages 4 years and above. These 6 apps should be the perfect introduction for your children to the world of (digital) storytelling. The huge plus of such apps is that it doesn't just learn them how to tell stories, it also sneakily teaches them other things, such as vocabulary, logical thinking, etc. Moreover, it is an opportunity for parents to engage with their children in a different, more creative way, strengthening the bond between parent and child. Want to know more about digital storytelling? Fill out this form to receive the REC newsletter!